A dead-end street in West Oakland’s Lower Bottoms neighborhood runs right into a sidewall of Interstate 880. For years, this was a vacant patch of concrete, with an enormous pile of illegally dumped dirt filling a lot next door. For a time, it became the scene of laughter, ollies and kick flips. A group of skateboarders decided to create an oasis in this impoverished corner of the city late last year, but recently agreed to abandon the site. “I feel happy here,” Kevin Jenkins said when the park was still open. He’s one of the dozens of skaters and supporters who built the Lower Bobs skate park, which takes its name from the Lower Bottoms neighborhood and the business next door, Bob’s Warehouse. 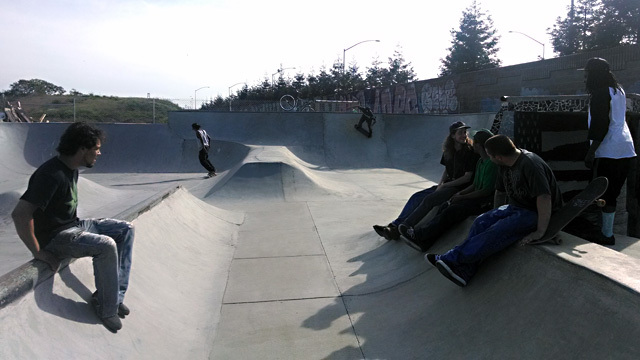 With school out for the summer and a shortage of resources for sports and other activities, Jenkins says a volunteer-built skate park in a neglected part of Oakland is just what the neighborhood needs. But keeping Lower Bobs might not be so easy. It was built without permission and in the face of numerous warnings to stop, said Joe DeVries, assistant to Oakland’s city administrator. “I came out when it was just a really small berm and I said, ‘You guys really need to stop. I’ll try to help you on the inside; we’ll try to make it legal,’ ” DeVries said. He thought he had the Lower Bobs skaters’ agreement, but when he drove by a few days later, “They were fully going at it, construction,” DeVries said. "No trespassing" signs were erected, and ignored. A fence was put up, and torn down. A skate park organization called Gauntlet stepped in to negotiate with city officials, which led to a neighborhood meeting in April. The majority of community members at that meeting expressed support for what they see as a bright spot in a neighborhood plagued by violent crime and blighted by illegal dumping. “I believe that it makes my community safer,” said Vlad Levitansky, who owns 10th & Wood, a cafe around the corner. A video posted online chronicles the construction of Lower Bobs. The park is the latest in a tradition of DIY skate parks, some of which have been legalized in other parts of California. San Diego’s Washington Street Skatepark was created in 1999, and after forming a nonprofit and negotiating with the city, it now draws skaters from across the U.S. The Channel Street Skatepark in San Pedro was constructed in 2002. Skater Andy Harris, president of the San Pedro Skatepark Association, says then-Los Angeles City Councilwoman Janice Hahn was an important ally. With moms dropping off minivans full of kids at Channel Street, it was clear the skaters had created a safe and important space. Keith Williams, or K-Dub, spearheaded the construction of Town Park, a legitimate skate park in West Oakland that opened in 2008. The well-known skater and community activist told those at the neighborhood meeting that government bodies need to be more open to working with skaters, or they leave them with few options. “Oakland is about seven parks underserved,” Williams said. He added that people who need a place to skate are likely to take matters into their own hands. “So when you don’t serve that recreation, then you get folks who have access to trucks and concrete and skills, wood and labor, to just do,” he said. But most Oakland skaters have yet to find their champion inside the system. Two other illegally constructed Oakland skate parks have been demolished in recent years, although both were on land owned by Caltrans, not the city. Oakland City Councilwoman Lynette Gibson McElhaney, who represents the neighborhood where Lower Bobs was built, said she’s willing to work with the skaters — but they need to change their approach. The skaters who built the park have agreed to stay away for now. But with no one managing the area, vandalism, drug use and a homeless encampment have all appeared. In the meantime, Gauntlet is working to obtain insurance, inspections and money to buy or lease the site.